Quartiles partition - as the name suggests - the corresponding distribution into four quarters each containing 25% of the data. 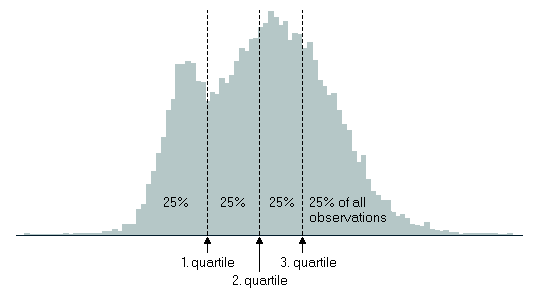 A particular quartile is therefore the border between two neighboring quarters of the distribution. The position of the first quartile is x = round(0.25*(20+1)) = round(5.25) = 5, which means that Q1 is the 5th value of the sorted series, namely Q1 = 0. The other quartiles are calculated in the same way resulting in Q2 = 5.5 and Q3 = 12. Remark on practical aspects: quartiles are usually calculated only for samples with more than 12 observations (a minimum of 20 observations would be even better).